Boone Central students at the U.S. Capitol. 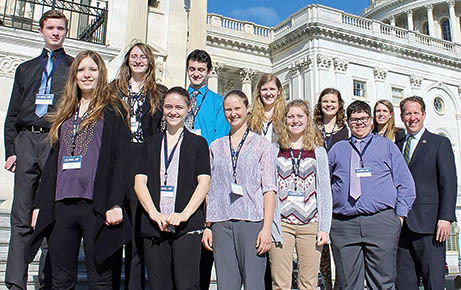 A group of 11 Boone Central High School students returned last weekend from a weeklong Close Up trip to Washington, DC. Among the highlights of their trip was a visit to the U.S. Capitol Building. Congressman Adrian Smith (R-NE) welcomed the students, and they accompanied him the House floor. Students who spent the week of March 26-April 1 in the nation’s Capitol included (front, l.-r.) Tyanne Johnson, Michelle Julsen, Sydney Wynn, Maggie Cleveland and Nickolas Thies with Congressman Smith; and (back) Walker Stuhr, April Johnson, Thomas Hosford, Nicole Woebbecke, Sierra Travis and Katie Daniels.